Last night I was fortunate to have dinner with Gaia Gaja (pronounced ‘Guy-ah Guy-ah’), whose fresh-faced charisma and alliteratively alluring name is rivaled only by the recently wedded Lauren Bush Lauren. Gaia is the elder daughter of Angelo Gaja, the Piedmont-based godfather of legendary Barolo and Barbaresco. The wines we enjoyed, including the 2009 Gaja Barbarbeco and 2008 Gaja DaGromis Barolo, were as floral, licorice-infused, and persistent as one would expect from Italy’s most renowned producer. There is no specific type of dog bred for truffle hunting, although smaller dogs with short hair are favored for their ability to move easily through forest underbrush. To determine which puppy of a litter has a special penchant for truffles, each is given its chow with a few flecks of real truffle. The puppy that responds most positively to the truffle is singled out for training. The dog will eventually be trained by letting it home in on a truffle wrapped in a napkin and then be rewarded with a dog biscuit. 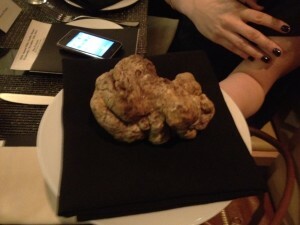 The napkin gets the dog used to the fact that he shouldn’t chomp into the truffle but instead wait for the biscuit. 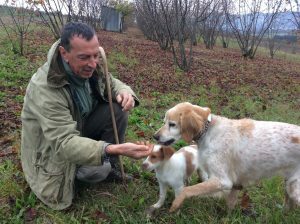 A truffle hunter and his canine companion often have an unusually close relationship, whereby the dog is allowed to sleep in the hunter’s bed, is fed eggs in the morning, and is cajoled and praised like a human. Said Gaia with feigned exasperation: “The dog is often treated better than the wife”. 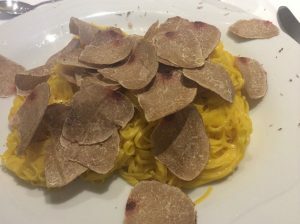 Although scrambled eggs or simple pasta dishes are the classic vehicles for shaved truffles, Gaia encountered her favorite all-time truffle dish at a restaurant in her local town of Barbaresco. It consisted of the swoon-worthy concoction of truffles shaved over a raw egg yolk surrounded by polenta that had been infused with pureed chestnuts and grated parmigiano reggiano. 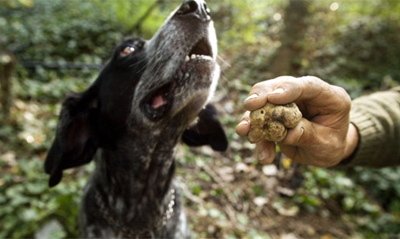 Some truffle dogs are trained to differentiate between black truffles and the more valuable white truffles. Upon sensing his tartufo target, the pooch will signal his master by stomping one paw for black, two for white.